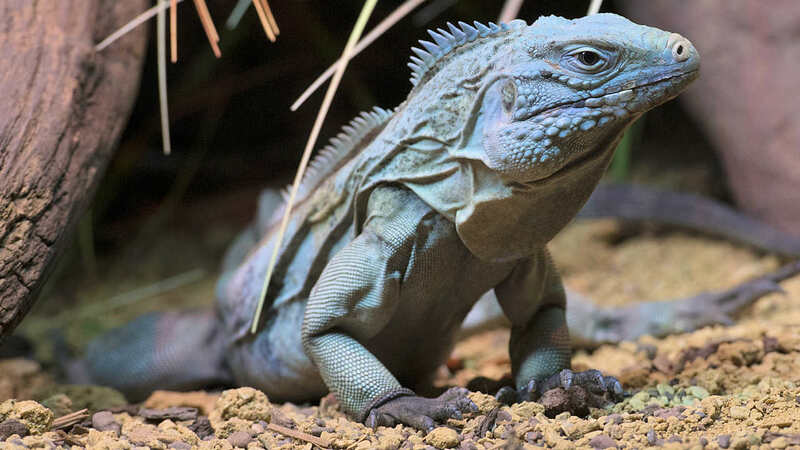 BRONX, New York (WABC) -- A new exhibit in the Reptile House at the Wildlife Conservation Society's Bronx Zoo features the Grand Cayman iguana (Cyclura lewisi), also known as the blue iguana. The exhibit is now open to the public and highlights an amazing conservation success story. Once numbering fewer than 20 animals, the species has been brought back from the brink of extinction. The Zoological Health Program, based at the Bronx Zoo, has been working with partners in the Cayman Islands for more than 15 years offering veterinary support for efforts that include captive breeding, incubating and hatching of both wild and captive laid eggs, and head-starting hatchlings at a breeding facility to allow them to grow large enough to better avoid predators before being returned to the wild. Veterinarians from the Bronx Zoo conduct pre-release health evaluations, annual health assessments of blue iguanas at the breeding facility and examinations of iguanas in the wild. "Although many people have never heard of a blue iguana, the animals at the Bronx Zoo will help us tell the story of their species - a wonderful story of conservation success," said Dr. Paul Calle, Vice President for Health Programs, Chief Veterinarian and Director of Zoological Health Program. "Blue iguanas were functionally extinct just a few years ago and would not exist on this planet today if it were not for the collaboration and intervention of these groups." The recovery effort, shepherded by the National Trust for the Cayman Islands Blue Iguana Recovery Programme, the Cayman Islands Department of the Environment and the IUCN Iguana Specialist Group, has released nearly 1,000 iguanas since its inception. Through ongoing monitoring of the wild population, scientists have determined that survival rates and breeding success in the wild has been positive and numbers are increasing. Blue iguanas are found only on the island of Grand Cayman. The species designation was recently changed from Critically Endangered to Endangered by the International Union for the Conservation of Nature (IUCN), a significant move that recognizes recovering populations on the island and the success of conservation work. The two young iguanas at the Bronx Zoo were bred at other zoos that participate in the blue iguana Species Survival Plan, a cooperative breeding program designed to enhance the genetic viability of animal populations in zoos and aquariums accredited by the Association of Zoos and Aquariums. The Bronx Zoo hopes to eventually breed the pair to contribute to the health of the species in zoos. Named for the beautiful blue hue of their skin, blue iguanas can grow to nearly five feet long and weigh 30 pounds as adults. They are the largest native land animal in the Cayman Islands. The main threats to wild populations are feral dogs and cats as well as human activities. For more information about the blue iguanas and the conservation efforts underway, read Dr. Calle's WildView blog. The Bronx Zoo is open year around, closed only on Thanksgiving, Christmas, New Year's Day, and Martin Luther King Jr. Day. Tickets can be purchased online at BronxZoo.com. The Blue iguanas are located in the Reptile House, which is included in the General Admission ticket.